Have you ever looked at a full or gibbous Moon through binoculars or a telescope? If so, you may have noticed some bright streaks that radiate outward from a few bright craters. These streaks are called rays, and the craters from which they originate are called ray craters. Most rays are composed of light-colored, fragmented rock that was ejected violently from craters when they formed from meteorites and comets smashing into the Moon at tens of thousands of miles per hour. The most striking rays on the Moon originate from the crater Tycho in the Moon’s southern highlands. 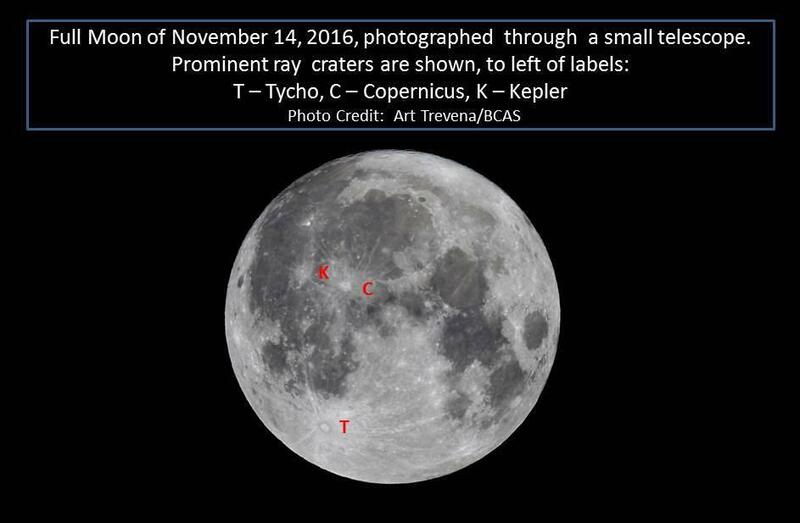 Tycho’s rays extend more than one thousand miles, across much of the Earth-facing side of the Moon and part of the lunar far side, too. The impact that created Tycho must have been extremely violent. Only the most recently formed lunar craters have obvious rays. This is because the typically light-colored material in rays darkens over time to match the surrounding terrain. This darkening is due to the action of space weathering, which is caused by the continuous onslaught of micrometeorites plus radiation and charged particles from the Sun and other sources. Samples returned by American Apollo missions and Soviet Luna probes have allowed scientists to date the origin of many lunar craters. Radiometric dating has shown that most lunar craters formed early in the history of the Solar System, 3.5 to 4.5 billion years ago. But ray craters are typically much younger than average. For example, the ray crater Copernicus formed about 800 million years ago. And the crater Tycho, a mere youngster, formed “only” 108 million years ago, based on samples from Apollo 16, which landed on one of Tycho’s rays. Rays and ray craters are not limited to Earth’s Moon. They’ve been recognized also on Mercury and Mars, and on many moons belonging to other planets in our Solar System.